Aims is sonically lush, adventurous, rhythmic, and sometimes beautiful, but Teng's often didactic and high-minded lyrics demand an awful lot of you. Let me get this part out of the way, because we've got a lot to talk about: California native Vienna Teng has a lovely, gentle mezzo and her new album Aims offers up pleasing folk-electronica somewhere between Imogen Heap and Kate Bush. She's got a gift for adventurous melody and a penchant for layered harmonies, and she's not afraid to take some aural chances; smartly arranged percussion and offbeat time signatures keep the lavender synth waves from treading too close to Enya territory. You could play Aims while you puttered about the house, and you'd be charmed by the sounds from your earbuds. But you'd also be missing out, because Vienna Teng is very, very smart. And she's got a few things to teach you. The songs on Aims cover a lot of ground. I mean – a lot of ground. Don't let the peppy, inspirational opener fool you -– Teng isn't here to just buck you up, but to clue you in to the miseries of the world, whether they're caused by evil corporations, efficiency experts, politicians, or you, for neglecting your mother. Aims is filled with interactive music -– it gives, but it asks a lot of you. As I just mentioned, "Level Up" is an energetic kickoff, supplying an effortless 7/4 beat that keeps the lyric from venturing too far into "Baby You're a Firework" territory. Nifty bits of guitar and strings pepper the programming, and while the lyrics don't expand much on the title, there are tasty hints ("Let your faith die / Bring your wonder”) that Teng has more to say than a platitude or two. Does she ever. With her next cut, "In the 99", Teng tackles the Occupy movement through the internal monologue of a sympathetic high-level banker ("But for the grace of code and capital / We'd cry out side by side"). It's a fascinating perspective, but what if I told you the CD booklet offers 14(!) footnotes for the lyrics, each corresponding to a website? Yep –- this song comes with homework, and since the rapid-fire verse is buried underneath a busy mix, the lyric sheet is welcome, even necessary. But still…14 sites, which include sympathetic essays from Warren Buffett, charts that outline the diminishing Social Security funds, definitions, even a plug for Nassim Nicholas Taleb's The Black Swan (reader, I visited them all –- never say I don't love you). All for a pleasant bit of electronica with an already heady premise. Next comes "Landsailor", another fully annotated track (only 13 this time), which, okay, I'm game, lemme open some tabs. But when the first footnote directs me to a page on supply chain management, my poor brain, already addled from so much learning, turns to tapioca. Look, the song's a poppy meditation on our increasingly dehumanizing and environmentally destructive drive for efficiency, which is fair enough –- we’'e a good 50 years past "Blowing in the Wind". But even with a cameo from Glen Phillips (Toad the Wet Sprocket), the result is more alienating than enlightening. Lines like "I split the world open / Delve ever deeper in my alchemic arts" move me a lot less than "there’s a storm outside my door / And I’m a child no more". Now consider "The Hymn of Acxiom”. A gorgeous, complex, a capella bit of didacticism, "Hymn" is a satirical paean to the end of privacy as delivered by the heads of Acxiom, the creepy, insidious targeted-marketing company (played by Teng and her overdubs). It's as sonically breathtaking as it is lacking in subtlety –- the lyrics are both comforting and sinister ("someone is learning the colors of all your moods") until Teng drives the point into the wall ("we possess all of you / Now we possess your time"). As the song builds, the vocals become increasingly processed and homogenized – nice touch, that. It's a stunning accomplishment, but to what end? To remind us our penchant for convenience is driving us to willfully surrender our privacy? Don't stop the presses. Like The Human Centipede, it may be a piece where the concept almost negates the actual product –- once I tell you what it is and what it's about, do you even need to hear it? To be fair, it ain't all millennial protest rants. "Close to Home" comes with a footnote as well, but it's welcome –- once we know the inspiration behind the lyrics, the odd rhythms and soaring strings take on haunting new meanings. And we marvel at Teng's empathy, on display here and the poetic "Never Look Away", which has a layered urgency that lets it get away with lines like "you are made of nebulas / And novas and night sky" (cue Neil deGrasse Tyson, nodding approvingly). The delicate "The Breaking Light" turns the folk-ballad structure on its head, placing haunting imagery ("listen to the breathing sea") next to a repeated refrain ("brother, you will return"); I wish the accompanying new-age track felt as organic as the lyrics, but the contrast is interesting and her delivery is gorgeous. She delivers the final cut "Goodnight New York" with a one-shot echo that makes her simultaneously intimate and distant, which is a good fit; even at her most personal, she keeps us gently at arm's length. But it's her critiques which keep using up all my bandwidth – heck, look how much space I devoted to three songs. I should relax –- even when it gets preachy, Aims clearly knows its audience (fans of this kind of music don't carry NRA cards). After all, this is an original, often personal, sometimes beautiful album, and no one's forcing you to fire up the browser. But maybe I'm just the wrong audience for some of this material. 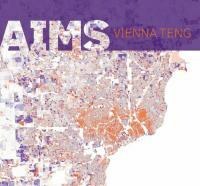 Even after all the learning and deciphering, what most of the cuts on Aims are ultimately about is how clever Vienna Teng is, how she's able to weave so many levels of consciousness into her works. And how you wouldn't mind if she went a little easier on us.